It was close to 6 pm but the sky is not dark yet so we thought we could do one more site before we call it a day. 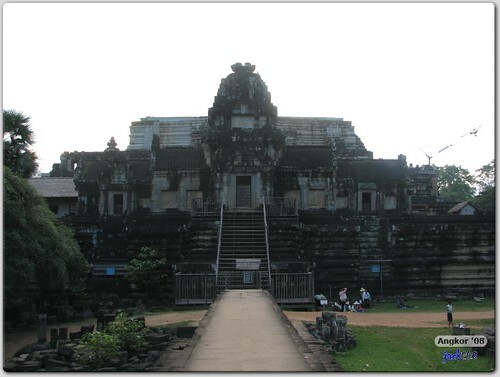 The Baphuon is the (Hindu) state temple to Yasodharapura during the reign of King Udayadityavarman II in the 11th century (that’s before King Jayavarman’s reign in the 12th century). 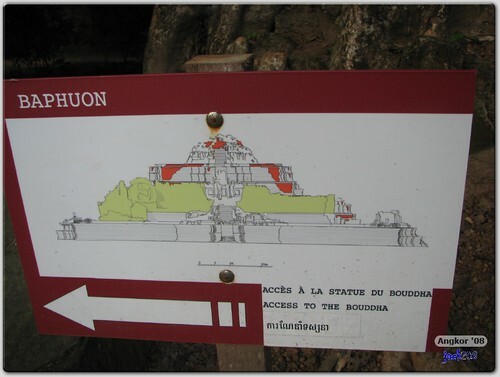 Even while the Bayon was in her prime (when she’s known as the Golden Tower), Baphuon was known as the Tower of Bronze and height-wise (50m) was actually taller than the Bayon. 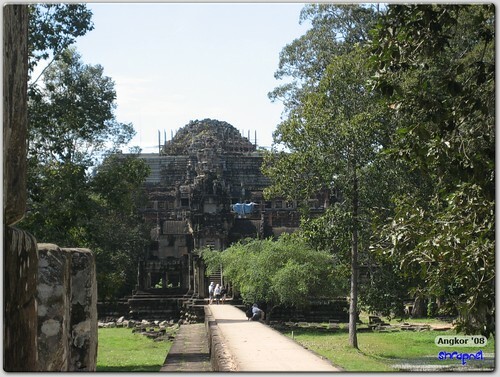 The Baphuon sits on a five-tier pyramid structure with an architecture that followed the temple-mountain concept where the temple sits on a large base (120m x 100m) representing Mount Meru. Sadly this temple has almost collapsed totally and there have been extensive restoration work being carried out by the EFEO which is still ongoing today. We couldn’t really access much of the temple and could only view it from the ground-level. Hopefully once EFEO have completed their work, some of the glory of this state temple can be appreciated again. 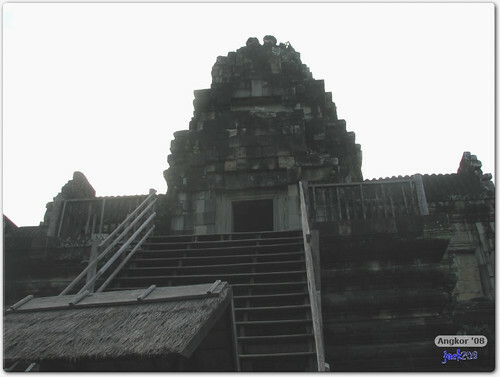 We approached this temple from the eastern entrance, having just left Phimeanakas. The first thing you’ll come across is the eastern gopura which surprisingly is still in pretty good shape. From here, we have to walk a raised causeway that’s about 172m long! 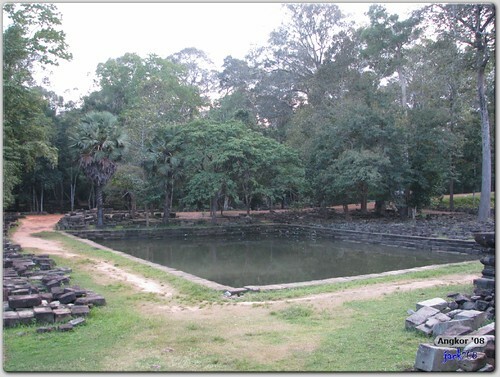 Halfway along the raised causeway, you’ll come across a ruined pavilion and small pond. We did not stop at the pavilion but were told later there are some very interesting bas relief carved into the walls of the pavilion. The temple itself is enclosed in a very large area of 425m x 125m by sandstone walls (most of which have collapsed now) but the gopura on the eastern side of the outer enclosure are still in relatively good shape. Sadly they’ve fenced off the entrance via this gopura and we need to go around the enclosure (to the right from picture below) to get back to the raised causeway beyond this gopura (ie. 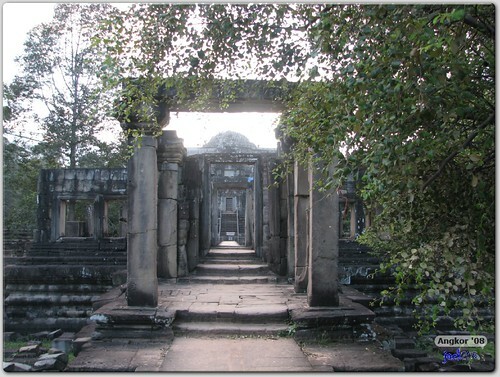 into the inner enclosure of the Baphuon). Once we are inside the outer enclosure, we cannot go any further with the rest of the temple being sealed off and we can only appreciate the temple from. We did make our way to the western side of the temple to view (what’s left) of the giant statue of a reclining Buddha, which is undergoing massive restoration work. It is interesting to note this temple started as a Hindu temple dedicated to God Shiva. It was then converted in the 15th century to become a Buddhist temple, and a giant statue of a reclining Buddha (H9m L70m) was built on the western side of the temple. The whole history of Cambodia is full of this Buddhist-Hindusim-Buddhist conversion, competitiona and sometimes co-existence as in Baphuon and also Preah Palilay. It was getting late (and dark) so we hurrily make our way back to the restaurant rest-stop in Angkor Thom where Man was waiting to fetch us back to the hotel in his tuk-tuk. 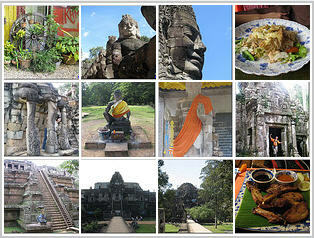 This concludes our Day One visits where we covered nine sites/temples all within Angkor Thom. After a quick shower back at the hotel, we went to Pub Street and looked around for a good place to have our dinner. 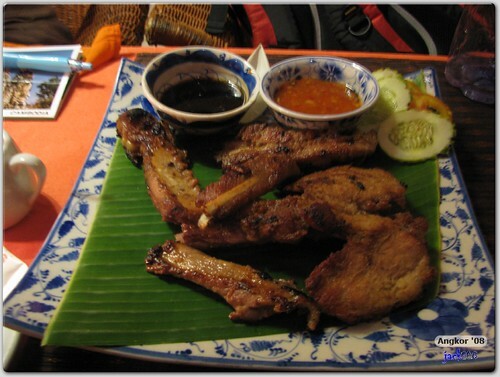 We wanted to try local food so restaurants like Kamasutra, Banana Leaf, etc were not on our radar. 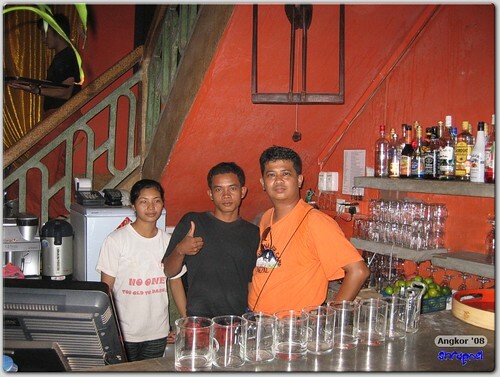 I’d read favorable reviews from a few blogs of Khmer Kitchen restaurant. Problem was I didn’t have their exact address so we were walking around Pub Street looking for it. 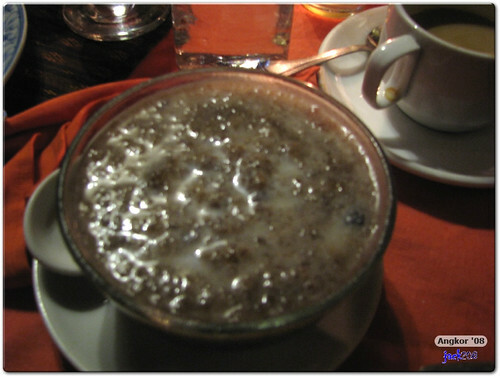 A tasty and not-too-sweet local dessert with something like sago in it. Food here’s based on the seemingly standard (tourist) price of USD3 for the main course and USD1-USD2 for the drinks. 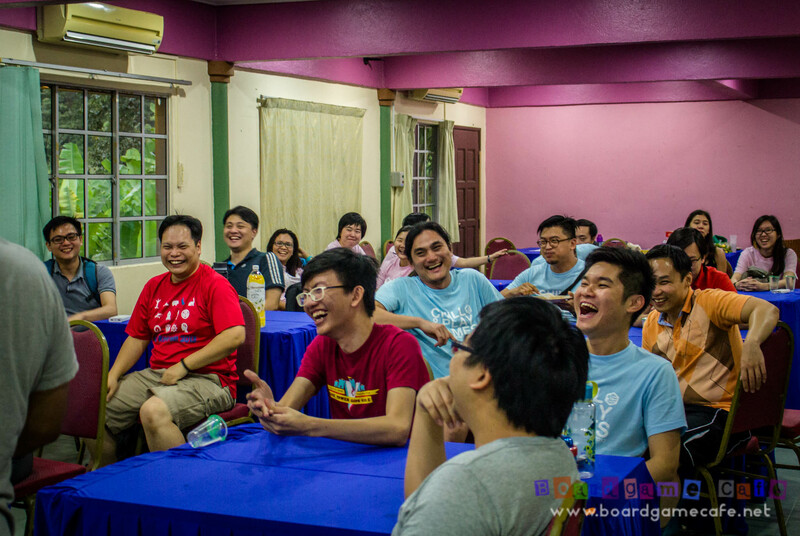 We spent average of USD5 per person for this meal. The next blog will be about the 2nd Day of our Angkor visit; where we started off with sunrise at Angkor Wat followed by the Small Circuit Tour of Angkor Thom.